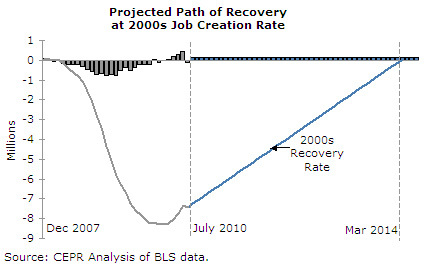 The official recession may be over, but the labor market is still a disaster. Tessa Conroy and I try to illustrate the magnitude of the mess in a CEPR report released today. 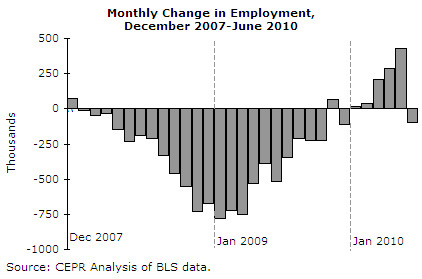 We start by showing the monthly change in employment from December 2007 (the month the recession began) through June 2010 (the most recent data available). Monthly job losses peaked in January 2009, declined through the rest of that year, and the economy has been creating jobs, on net, so far this year (last month is the only exception). But, the monthly change in employment doesn't tell the whole story. 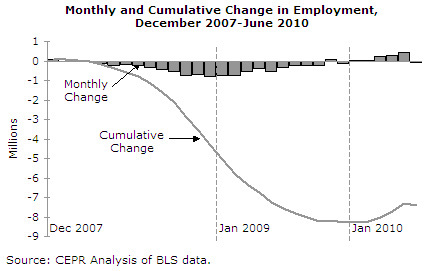 In the next graph, we reproduce the monthly change in employment, but also show the cumulative change in employment from the beginning of the recession. The cumulative line gives a much better idea of the size of the hole we're in. But, it gets worse. The potential labor force is growing every month as the working-age population expands. 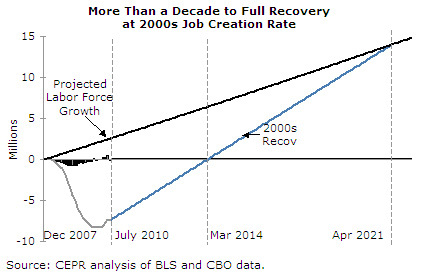 Using estimates derived from the Congressional Budget Office (CBO), we made a fourth graph, showing how long it would take --at the 2000s job-creation rate-- to catch up to the expanded labor force. Under those assumptions, job creation doesn't overtake the growth in the labor force until April 2021. 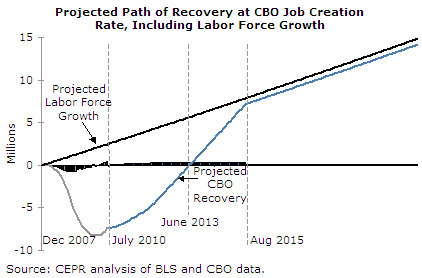 We also did a similar exercise assuming that the economy follows the path spelled out in the current, slightly more optimistic, CBO projections. The picture is a little better, but the economy still does not return to pre-recession employment levels until after the 2012 elections (June 2013) and does not catch up to the growth in the labor force until well into the next presidential term (August 2015). UPDATE 09/06/2010: Larry Elliott features our report in a recent column for The Guardian.